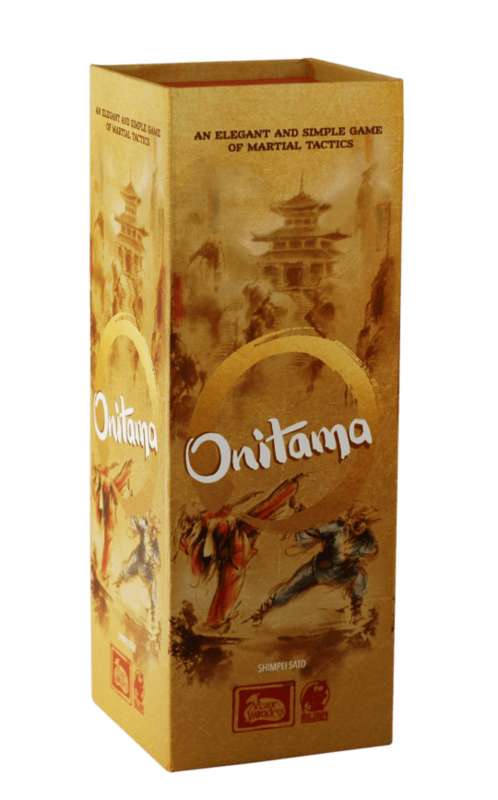 Onitama is a two-player, perfect information abstract game with a random starting set-up. On a 5×5 board, both players start with five pawns on their side, with the main pawn in the middle. Each player has two open cards that each display a possible move for any of his pieces. There is a fifth card that cannot be used by either player. On a player’s turn, he chooses one of his cards, moves one of his pieces according to the chosen card, then replaces the card he used with the fifth card. The other player then chooses one of his cards, moves accordingly, and exchanges that card with this fifth card — which is, of course, the card the first player just used. Moving onto one of the opponent’s pawns removes that pawn from the game. Taking the opponent’s main pawn, or moving your main pawn into your opponent’s main pawn’s starting space, wins you the game.